I wish all of you, especially those most in need, the possibility of taking a little vacation to reinvigorate your physical and spiritual energies and recover a salutary contact with nature. 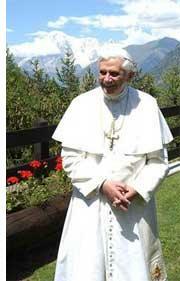 Those words from Pope Benedict XVI during his Sunday Angelus as he begins three weeks of vacation today. From July 9th to 27th, the Supreme Pontiff will be vacationing at a house in the Alpine mountain range, the Dolomites, in northeastern Italy. This vacation means that the Holy Father will not be giving his weekly Wednesday General Audience, seen here on Salt + Light Television, for the next three weeks. General Audience will resume once again on August 1st from the papal summer residence, Castel Gandolfo, 30 kilometers south of Rome. In the meantime, let us remember to keep the Holy Father in our prayers, that be may have a restful, blessed, and safe holiday!